One of the things that initially drew me to this project idea was the ability to create interesting coloured atmospheres. Gradients are always fun to play with but I think its more interesting seeing these gradients in real life on both real planets and conceptual planets in movies, games and artist’s impressions. Using Maya’s dynamic fluid system I created 3D fluid containers which contain a large number of particles. There are a number of attributes available to edit. 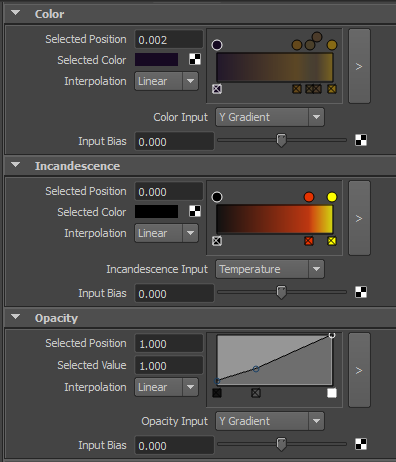 To create these gradient effects I’ve mainly used the Color, Incandescence and Opacity ramps under Shading settings. There are a number of other settings that affect the nature of the particles and how they react with the environment. I may or may not mess around with these as I don’t particularly need my atmosphere moving, I just need it to exist. That being said, I will probably want to edit the opacity and colour ramps at ground level to increase the air density.